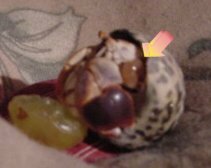 Just before the moult, the gel sack (Which is under the abdomen, inside of it's shell) will develope. The gel sack is where the hermit crab stores it's food for nutrients and energy durring the moult. Also the gel nubs (If any) will grow, and in time, start to turn darker in color. Usually this color will be orange or a brownish color. This color change indicates that the hermit crab will be moulting within the next 24 hours. Before hand, they will stock up on the needed food, water, and other nutrients needed for their upcoming event and then find a safe place to begin their task. Usually hermit crabs will dig under the sand, or under some other substrate to keep from being eaten by predators during a molt. A few like to moult above ground, but usually only when they feel safe, stressed, or when they are too weak to dig. At this time they will grow very still and after a while their dry old exoskeleton comes off, usually peeling from the back or the side of the hermit crab. After this they will be completely bare and need plenty of rest. After the exoskeleton is off, they will eat it for the added nutrients that they need to continue the process that has started, and rest while they wait for the new exoskelleton to harden. Many owners tend to throw away a molting crab due to thinking that they are dead. The crab is not dead, but in a way going through a great growth spurt and in need of some “growing room”, and what the owner thinks is a dead crab is actually just it's old exoskelleton laying on the ground in front of it's shell. Look deep within the shell and you will most likely find your crab sitting snug witin. Some remain outside of the shell. Just leave them be with adequate humidity and heat, and the crab will usually be fine. A dead crab will have a certain stink about them before too long. Kinda of like dead shrimp. If you are not use to seeing a crab during the molting process, then just leave them alone to be sure that they are not dead. If you smell the fishy smell, then you will know that your crab is dead for sure. Once you have seen this process a few times you will grow more accustomed to what you have on your hands and be more prepared. Take note that while your crab is going through a molt, try your hardest not to disturb the crab. Let nature run it’s course and wait for the happy day when he/she comes out looking and feeling like a new crab. This is very hard for many of us, but honestly the best thing is to leave them be. Added stress can cause harm to your crab at this time. If you see your crab above ground to molt things may be a bit different. You should try to move your crab as quick, yet calm as possible, to a secluded area where there are no other crabs to bother him. Some hermit crabs have been known to eat the exoskeleton of a friend (which the molting crab needs), and sometimes causing it to get carried away and eat his friend also, so it is best to be cautious. Your crab needs to eat its exoskeleton after it molts to help harden its new exoskeleton, so secluding your crab is best if you notice that he/she is going to molt. If for some reason the exoskeleton has been taken from your crab, try adding a good calcium source (Such as cuddlebone, finly crushed coral, boiled and crushed egg shells, ect..) in the tank, near him/her. This will give your crab something to fall back on, to help it through the molt without troubles. 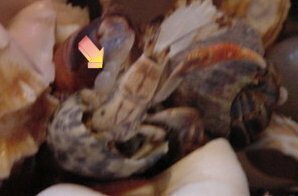 Some have recommended that you do not move the molting crab if you see it has already begun the molting process, but instead place a top portion of a 2 liter bottle with the lid off over the top of your molting crab. Just cut the bottom part of your bottle off and stick the entire top piece over him/her, as deep into the sand or other substrate as you can. If you have marble (Or smaller) sized crabs, I recommend using a bit of cheesecloth or netting type material secured over the top part just so your smaller crabs do not get into the molting crabs space. When your molting crab is back from his/her molting experience you may find that he or she looks very different. 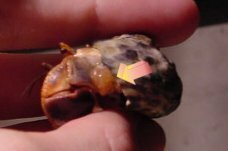 Hermit crabs tend to have a change in color, and sharper points to the tips of each leg, and once again, they may need a new shell to fit into. Rest assured though. If your pet was your best friend before, his/her personality will not change due to the molt. He/she is the same hermit crab that they were before. General lethargy, cloudy eyes, food sacks, excessive digging, stocking up on food and water, and the gel limbs (If any) will begin to turn into a brown or orange color. As stated before, the gel means they are starting the process of regenerating a limb. You may also find that your crabs will become less social. This is normal. After the molt is through, your crab should be back to his/her old self. Just give them time .